The kitchen, while one of my all time favorite places isn’t what I think of when dreaming of what this mama wants for Mother’s Day. I mean, really! Shouldn’t the day be about me and not something that will benefit everyone in the family. Listen, if 5 years ago you would have told me that I would be silently hoping one of my parents came through with a kitchen appliance for a holiday gift I might have looked at you side eyed. Yet, when I attended a FoodSaver event last month that is exactly what I started to do. Along with a few other bloggers present I started looking up the cost of the the FoodSaver FM1100 online. I was invited to attend the event as media and received product after. As always opinions are solely mine and completely honest. I came home from the event and started telling JustaBXgrandpa all about it. 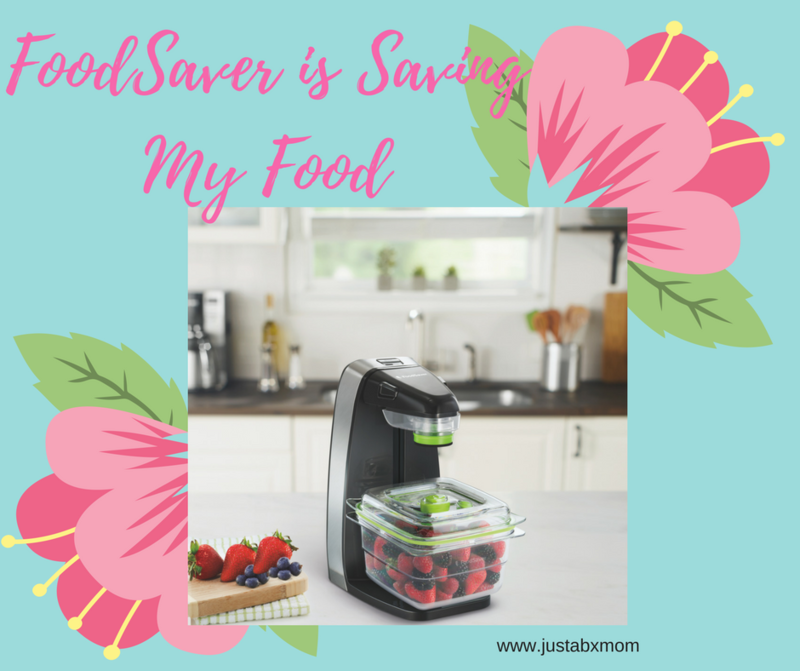 He, who is usually my voice of reason when I want to spend on things I probably can live without, began to praise FoodSaver as a brand that MY grandmother has used for years. I knew then that yup, one of these bad boys would be making an appearance in our kitchen soon. Figured I would ask my mom to get me one either for Mother’s Day or my birthday. Guess this is how you know you’re an adult. Either way, a few days later the FoodSaver fairies (dressed as a UPS or FedEx deliveryman) appeared at my door. I was gifted a FM1100 for attending the event. Happy dance commence. What is so exciting about this machine you ask? Well, let me tell you. In one example, I made me a salad today (yesterday since it’s after midnight while I’m typing) with almost three week old spinach! And none of it was wilted because my little miracle containers keep it fresh. Another example, I bought cucumbers about a week and a half ago. I left one on the kitchen table. The other JustaBXgirl asked me to cut up half as a snack. I put the remainder in a FoodSaver container and it’s still good. The one on the table had so much mold I didn’t even want to touch it. (After I stopped being grossed out I kicked myself for not taking a picture). JustaBXgrandpa doesn’t eat vegetables. JustaBXgirl does but only the ones she’s in the mood for at the time (last few days have been green bean kind of days). Too often do I end up throwing out fresh food because it goes bad in the refrigerator. My new toy reduces that drastically. JustaBXgirl is still in that food not touching stage even though lately she’s been experimenting a bit more. She now lets me add cucumbers to her spinach and maybe corn if she’s feeling adventurous. Still it makes me sad to think if I buy all the yummy ingredients for a salad rather than paying anywhere from $6 – $13 for a store bought one that at least half of those ingredients would rot and end up in my garbage. With this appliance I can buy my ingredients and not be forced to eat them all in a day or two. Look at how cute the containers are and they stack on top each other easy. And trust me, I get the doubt you might be having. I’m regularly skeptical of things that seem too good to be true. It’s one of the reasons I didn’t post this review as soon as I got the device. I wanted to really get the chance to try it out and see what I really thought. It’s so simple to use that JustaBXgirl can seal the containers. She learned the day we received it how to place the container and start it up. It also is quick. In less than a minute all of the air is vacuumed out and your container is sealed. Now to unseal, you might need a little muscle once you unlock the container. If you’re into kitchen stuff then you definitely want this on your shelf and it doesn’t take up much space. Look at how cute it is! And it fits perfectly on my shelf next to the microwave.